Financial Meltdown, Protracted Negotiations: Will the Greek Bailout Deal Work? The massive sell-off on Monday was partially triggered by the release of three surveys which revealed that Greek manufacturing output has plummeted to its lowest level in July 2015. The surveys have indicated that Greece will suffer a further contraction in its economy this year. The investors are wary about the dismal outlook of the Greek economy which was in recession during 2008-14. In addition, there is general uncertainty over the country’s membership of the eurozone. Even though Greece struck a €86 billion bailout-for-reform deal with its official creditors on 12th July, news reports on the ongoing negotiations doubt whether an agreement could be reached in time to service the debt due this month. Greece is keen to conclude the negotiations on bailout deal by mid-August so that it gets the money before debt repayments are due. In August, Greece needs as much as €24 bn to service its debt, recapitalize the banks and to meet other financing needs. This figure includes €7 bn to repay an emergency bridge loan, €3.2 billion towards Greek bonds held by European Central Bank and close to €10 towards recapitalisation of Greek banks. If no agreement with creditors could be reached before 20th August, Greece may seek another bridge loan to avoid a doomsday scenario. It is very difficult to predict the outcome of the ongoing negotiations as the troika is demanding the strict implementation of austerity measures by Greece. The creditors will only release money if Greece implements tough austerity measures. On 23rd July, the governing Syriza party won crucial approval from the Greek parliament for the new bailout reform program being negotiated with creditors. Much of the opposition came from Syriza’s Left Platform faction which is opposed to austerity measures sought by creditors. The new bailout deal on the table is much more stringent and wider in scope than the previous ones. The new deal demands large-scale privatization of public assets (such as electrical and utility companies, airports and ports), substantial cuts in pensions, overhauling of value added taxes and changes in labour laws. It is important to note that many of these demands were earlier rejected by the Syriza government as well as by voters in a referendum held on 5th July. The Greek public is still struggling to understand the abrupt change of course by Prime Minister Alexis Tsipras by accepting all terms dictated by creditors. In its July 8 letter seeking a new bailout program, the Greek government has agreed to implement pension and tax reforms as early as mid-July. One of key controversial elements of the new deal is the setting up of an externally supervised fund to manage the privatization of Greece’s public assets. The Greek government has accepted the demand put forward by Eurozone leaders that Greek public assets worth up to €50 bn should be transferred to an independent fund. Based in Luxembourg, the proposed fund will be run by an entity overseen by Germany’s finance minister, Wolfgang Schäuble. But the moot question is: Would the people of Greece benefit from the money generated by this fund. The answer is No. Bulk of the money generated by the fund through assets sales will be used for repaying money borrowed from creditors and reducing the debt burden. There is no provision for channelizing the money to support social programs or investing in social and physical infrastructure. Given the real situation of the economy, Greece may not achieve the creditors’ targets for the primary budget surplus. A primary budget surplus occurs when tax revenues exceed government spending (excluding debt interest payments) which enables the government to deploy surplus revenue to pay the public debt. The creditors are demanding that Greece achieve a primary budget surplus of 3.5 percent of GDP by 2018. In its previous negotiations with creditors, the Syriza government had sought a gradual increase in primary budget surplus to ensure that austerity measures should not act as a drag on economic recovery. Due to slowdown in business activity in Greece, the target of a budget surplus of 1 percent this year is likely to be missed. Rather, a deficit is expected this year. The next year target of 2 percent can only be achieved through a heavy dosage of austerity measures as the introduction of new tax measures may take some months. Further, the long-standing demand of Syriza government seeking substantial debt relief is not part of new bailout package. Nor is there any assurance by creditors that debt relief would be forthcoming in future. This is despite the fact that the International Monetary Fund has expressed its unwillingness to participate in the new bailout program unless substantial debt relief is immediately granted to Greece. Can Germany and other European creditors sign a new deal without the IMF? The kind of popular support needed to implement tough policy measures is squarely missing in Greece. The government is finding it difficult to convince citizens that debt relief is still not under consideration. The proposed privatization fund and other austerity measures are deeply unpopular in Greece. There is considerable opposition to privatization fund within the Syriza party. Hence, it would be very challenging for Syriza-led government to implement demands of creditors while maintaining its social base. Needless to say, Syriza is the first anti-austerity party to take power in Greece. It won election in January 2015 promising to end the austerity measures and renegotiate the country’s debt. Already some commentators are reading the ongoing negotiations as a “sell-out” by the Syriza on its election promises. Most likely, the government may seek a fresh mandate by holding snap elections in September or October. As things stand out, the prospects of an economic recovery in Greece appear bleak. Many forecasts have predicted that Greece will be unable to break the vicious cycle on the current path and its debt-to-GDP ratio will rise over 200 percent by 2018. Without rapid economic recovery, Greece’s debt burden will remain unsustainable. 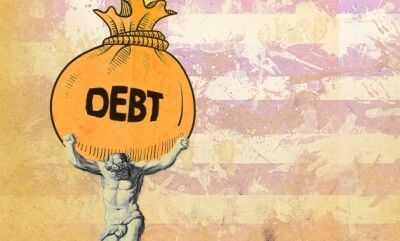 The growing public debt and its servicing costs will burden economy further. And if Greece continues to remain in the eurozone, a fourth bailout cannot be ruled out in future. Kavaljit Singh is Director of Madhyam, a policy research institute based in New Delhi.